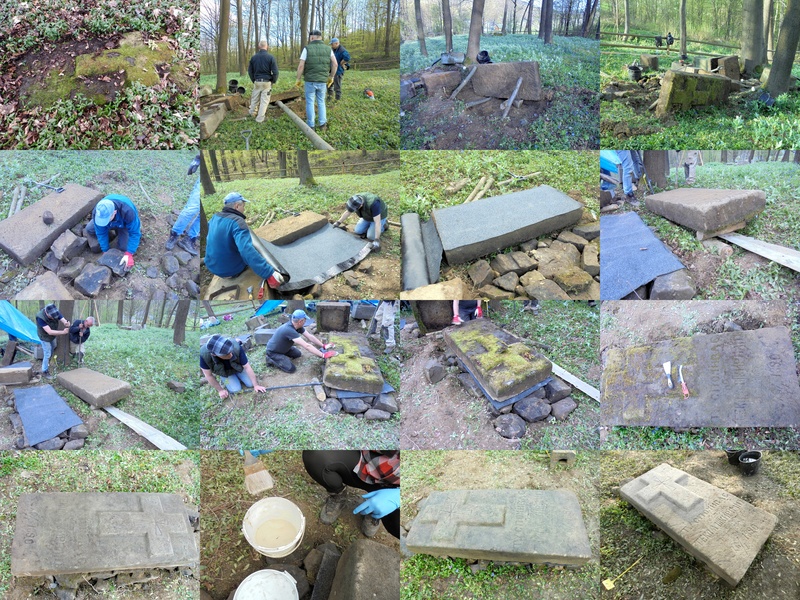 As we reported several weeks ago, I was invited to participate in a cemetery marker restoration workshop organized by Stowarzyszenie Magurycz (Magurycz Association) in the south of Poland; it would be a chance for us to learn from their 30 years of experience in the care of stone cemetery markers and other monuments. 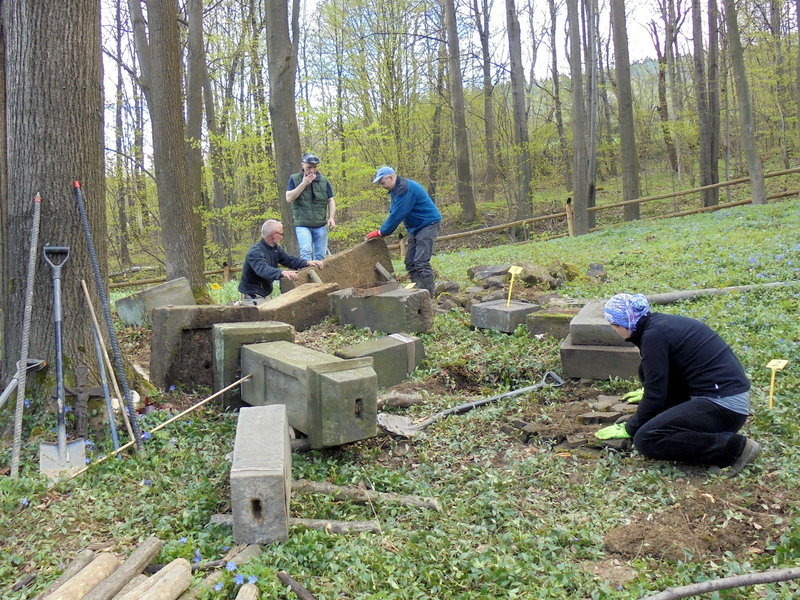 I just got back from three days working onsite with the volunteer team, and it was an excellent training encounter which will help our planning and rehabilitation work in Rohatyn’s Jewish cemeteries. 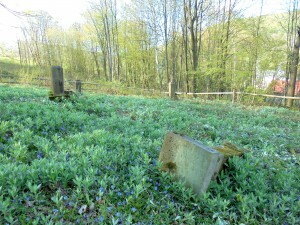 The quiet Lemko cemetery in Małastów with grave markers in ruin. Photo © 2016 Jay Osborn. 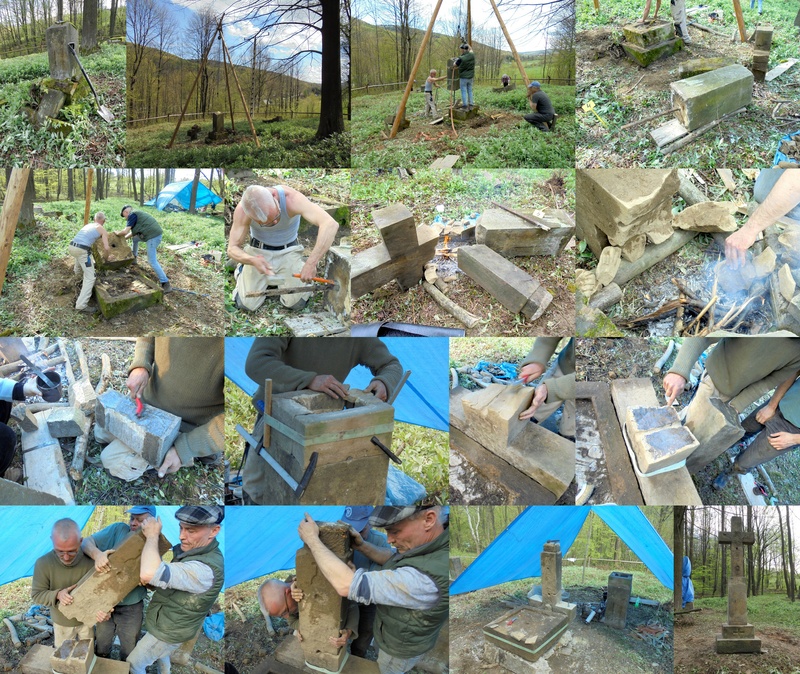 This workshop lasted a week at two cemeteries and four roadside crosses in the beautiful Beskid Niski mountain region, adjacent to the Magura National Park and the Slovakian border. 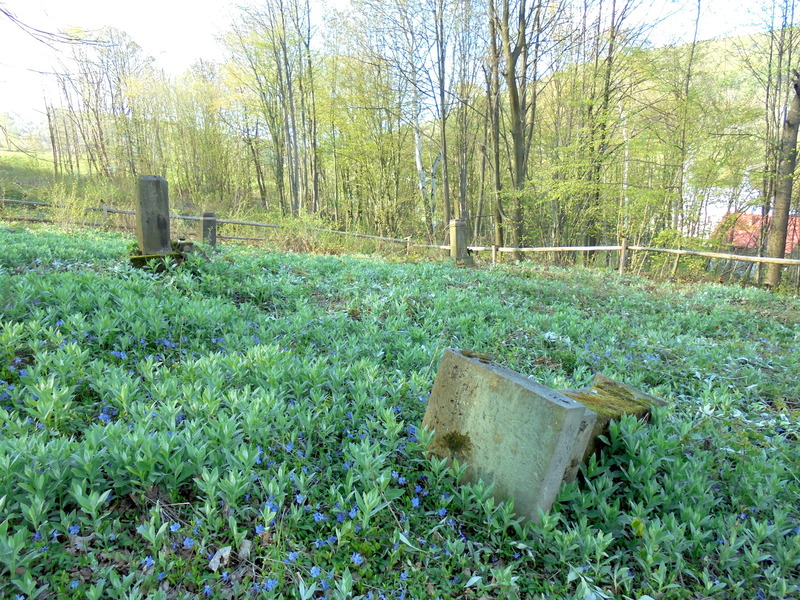 I joined only the largest project, at the old periwinkle-covered Lemko cemetery in Małastów. As in many villages in the area, the Lemko population which had lived in Małastów for centuries was part of post-war Soviet forced deportation to the northwest; few families were able to return later, leaving their historic cemeteries, churches and other built culture subject to gradual ruin. The Magurycz workshops aim to stabilize, re-assemble, repair, and preserve the surviving markers in these and other cemeteries (Boyko, Jewish, German, etc.) 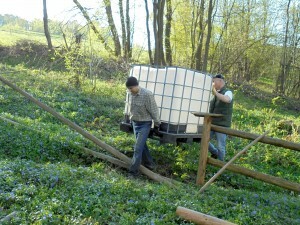 in East Central Europe where there is no longer a local community to care for the sites. All of the work materials are brought to the site by the team. Photo © 2016 Jay Osborn. 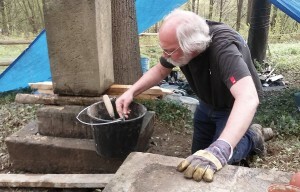 Over three decades, the association and many volunteers (some of whom have returned for workshops for five, fifteen, or more years) have developed safe and sensitive methods for conducting their work with a minimum of equipment, much of it built onsite from local materials. Experience has made them efficient and effective; as a beginner, I often slowed them down with my confusion or questions, but they were very patient with me and gave me many opportunities to learn hands-on how to handle the stones and tools. It is hard and heavy work; the team’s physical strength and endurance are impressive. 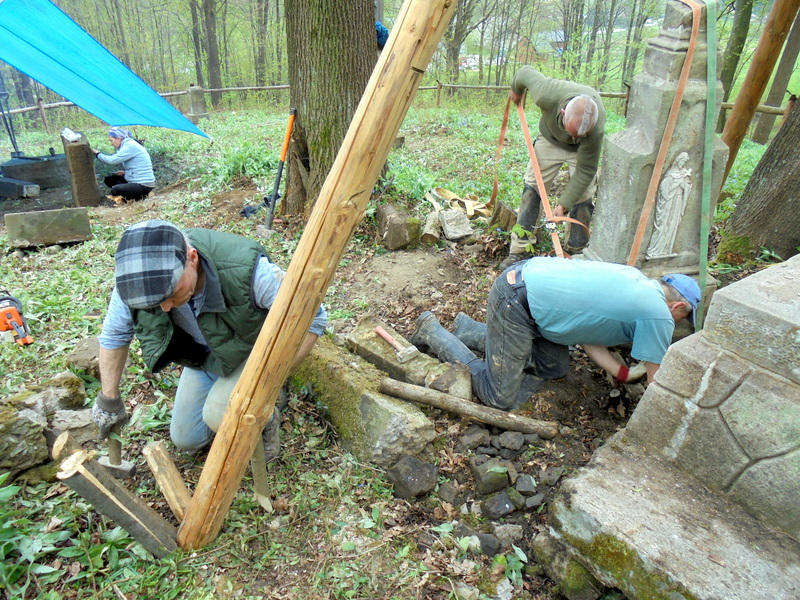 The restoration of a broken cross and damaged stone grave marker assembly. Photos © 2016 Szymon Modrzejewski and © 2016 Jay Osborn. The work starts with documentation, tagging, and photographs. Before I arrived in Małastów, association leader Szymon Modrzejewski had identified eleven surviving sandstone markers, all in various states of decay: typically the taller monuments had topped and partially fallen apart, and some stones were split by corroded iron inserts. Where the several stone elements of each marker were still attached, the team had already separated some to look for hidden flaws, such as iron dowels cemented between stones which would eventually lead to failure. A typical scene during the workshop: four different tasks in progress simultaneously. Photo © 2016 Jay Osborn. light scraping and careful brushing to remove organic matter and earlier adhesives, etc. Much of the work requires careful attention to surface erosion, halting water-driven decomposition, and removing damaging moss and lichen. Photo © 2016 Jay Osborn. Much of the work is focused on halting and reversing disintegration of the sandstone markers from exposure to soil-borne water. I was at times astonished by the different degrees of damage on individual stones based on which faces had been in contact with the soil. This is a key finding which should influence our own plans in Rohatyn. It looks chaotic, but the parallel-effort system is efficient and allows one marker to stabilize while others are in movement. Photo © 2016 Jay Osborn. In some cases in the Małastów cemetery, the monument stones were small- or medium-sized and could be lifted by hand by one to three volunteers. More commonly, levers, rollers, and ramps were needed to manipulate and position the stones; these tools were either brought to the site by the team or fabricated from available trees and rocks in and around the cemetery. In one case a 5m-long log was used as a lever, and the weight of three men (including me at the end) was needed to raise a huge monument base to level. The team joked that they work like ancient Egyptian slaves, but their process is engineered to amplify the strength of the workers while slowing stone movements to protect both the markers and the volunteers. It was fascinating for me to observe Szymon in the cemetery; always on the move, the only time he seemed to be still was when he was studying some problem with the stones that needed special attention to solve. A huge monument is extracted, cleaned, leveled, and re-assembled over several days, using simply-engineered methods and tools. Photos © 2016 Jay Osborn and © 2016 Szymon Modrzejewski. For the largest stones, special methods were required. A 6m-tall site-built tripod was erected in these locations, and a block and chain hoist employed to slowly lift, move, and replace parts of each large monument, all by hand. When work completed in one location, the tripod was moved to another to start work there. More than a few surprises awaited us in the cemetery. Photo © 2016 Jay Osborn. Some of the work was more delicate, whether on large stone pieces or small. In these cemeteries, the top piece of the markers was usually a cross, made of either iron or stone; many of these were damaged when the stones had toppled years ago. The iron pieces were taken offsite for treatment to remove corrosion and to encapsulate them against water (and to protect the stone base when they were re-inserted). The stone pieces were dressed and, where possible, were re-assembled with special adhesives after slow drying to enable a strong bond. On several of the markers, tall stone pieces were fitted with copper-alloy (bronze) dowels to replace the original iron parts but without risk of corrosion swelling. An important component of the Magurycz approach is social. In the Małastów workshop I joined, that included volunteers from the local Lemko community working alongside some of us from much farther away. And it brought out the legendary hospitality of Central European villagers; those of us from out of area were given beds in the villages at night, and during the day villagers brought home-prepared dishes and cakes to supplement the meals arranged by Magurycz and prepared by the team. The massive stone slab grave cover of Tekla Shkyrpan is lifted, stabilized, leveled, cleaned, and protected. Photos © 2016 Szymon Modrzejewski and © 2016 Jay Osborn. 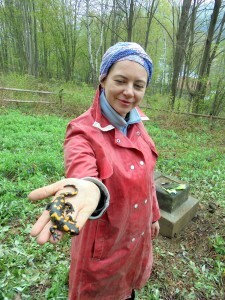 The photos in this report are a small fraction of what I took during my days with the other volunteers. I will assemble those and my notes to provide a reference on this website for stone care in the Rohatyn Jewish cemeteries, and will supplement the Magurycz methods with guidelines from other sources, including a manual now in development by the Foundation for the Documentation of Jewish Cemeteries in Poland for Jewish Heritage Europe, from the Association of Gravestone Studies, and from other sources. There was something new to learn almost every hour. Photo © 2016 Filip Modrzejewski. Of course I could only learn a fraction of what we need for Rohatyn in three days (while there were English-speaking volunteers available), at a single site with the Magurycz workshop, but it was a very good start. I am grateful for the opportunity and for the investment the Magurycz team made in me; I hope to repay that with further volunteer work in future workshops (and more opportunities to learn). The work Magurycz does is important; in many cases these cemeteries would fall into complete ruin without their voluntary intervention. How to donate and/or volunteer to support their work is described on their Facebook About page. I am very pleased to say “dziękuję” to Szymon, Olga, Filip, Mariusz, Maria, and Slavko for their spirit and their great help to me (and all of us) in this marvelous experience.